There are many surf rods you can use for saltwater fishing but few as a 4 piece rods intended for travel. We produce models ranging from 9'-12'. We have produced what we see as a tough surf rod with travel in mind. Made of quality composite blanks, with a tough, slim X Flock grip for casting ease, durable anodized aluminum reel seat, and aluminum oxide guides with ceramic inserts. THE LARGEST SELECTION OF TRAVEL RODS IN THE INDUSTRY! Visit www.santiamfishingproducts.com for additional details. Durable Surf Spinning Saltwater Rod, designed for distance casting. New! Our rugged X Flock grip ,durable aluminum reel seat, and aluminum oxide guides. Santiam Fishing Rods leads the industry with the largest selection of Travel Fishing Products. We design and extensively fish all our rods on local waters in Oregon, Washington, and Alaska to our own demands. No models are produced until after we are 100% satisfied with performance and durability. Built for the best fishing experience possible. Backed by our 3 year limited warranty, product support, and the best service in the industry! 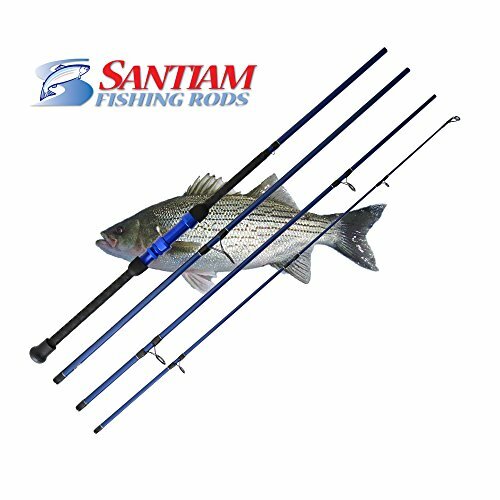 If you have any questions about this product by Santiam Fishing Rods, contact us by completing and submitting the form below. If you are looking for a specif part number, please include it with your message.